Jossie Valentin, Tahirah Amatul-Wadud, Na’ilah Amaru and Sophia Marcellus ’21 speak at the conference. The conference consisted of workshops that taught students “peer networking, professional and personal development skills,” according to the event’s webpage. The conference also included a business expo networking event, a student highlight workshop that featured Destiny Williams ’19 as a speaker, a keynote panel discussion and a VIP meet and greet with the panelists. Latrina Denson, Associate Dean of Students, Community and Inclusion and the SOCC advisor, spoke about the importance of the conference. “It’s a time when we actually center women of color, who are often one of the lowest people on the totem pole, unfortunately, and tend to be overlooked,” she said. According to Denson, approximately 200 people registered for the conference and around 150 people attended. The keynote panel discussion was lead by Sophia Marcellus ’21, chair of the SOCC. 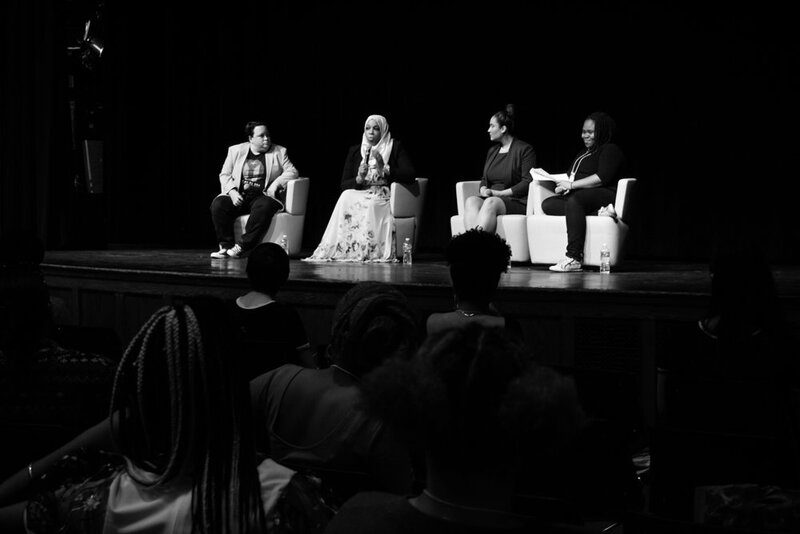 It featured keynote speakers Jossie Valentin, Tahirah Amatul-Wadud and Na’ilah Amaru. According to the event’s program, Valentin is currently in her third term as Holyoke City Councilor and will soon work as the state director in Massachusetts for Elizabeth Warren’s presidential campaign. Amatul-Wadud is an attorney who won as the Democratic candidate for Massachusetts’ 1st Congressional District in the U.S. House of Representatives. She ran against 29-year incumbent Richard Neal and received 30 percent of the vote. Amaru is an advocacy and policy strategist. Previously, she was a policy advisor to former Atlanta Mayor Kasim Reed, a legislative aide to U.S. Congressman John Lewis and executive director of the New York City Council’s Black, Latino and Asian Caucus. Currently, she consults with community-based and nonprofit organizations on issue-based and legislative campaigns. The panelists discussed a variety of issues during the panel, which lasted for an hour and a half. They talked about their backgrounds, the challenges they endured, how they overcame them and shared advice with the students of color in the crowd.